Another "World Diabetes Day" but this year it's 2018. If you asked him about 20 years ago, November 14th wasn't a day to pay any interest at all. All he could remember from way back was that, his late grandmother always refused to buy him sugar as part of his provisions, in a bid to prevent Diabetes mellitus in the future but fast forward to just over 10 years ago, the symptoms seemed to be classical as his father breathed his last; protein deposition in the eyes...leading to poor vision (Cataracts); progressive weight loss despite feeling constantly famished and eating adequately. To crown it all, excessive urination following frequent drinking of water from constant thirst. This was nothing other than Diabetes Mellitus, even if the cause of his father's death wasn't officially stated. Ignorance was the actual killer in then days. This year the theme of World Diabetes Day 2018 is "Diabetes & The Family". 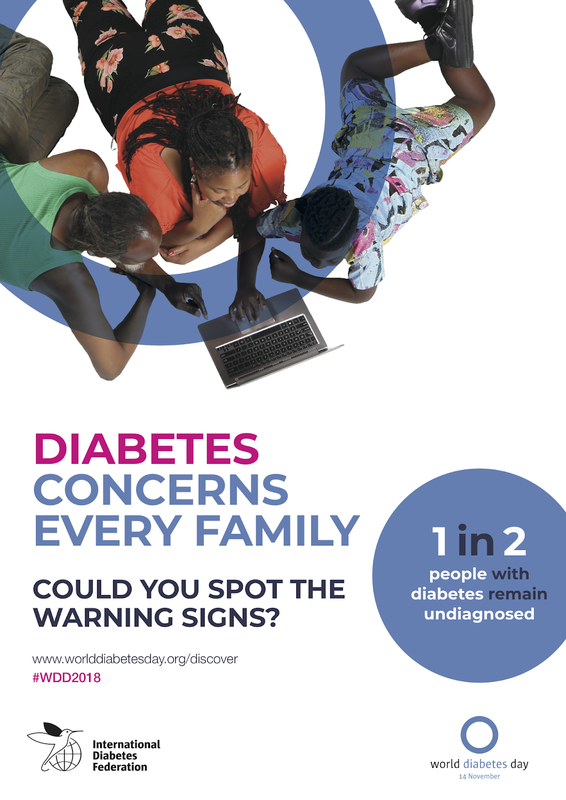 I'll save the long stories for the International Diabetes Federation posters and Infographics to do the talking. Here's what you should know about the disease condition that has to do with poor/zero natural control of body sugar and how it concerns every family. Could you really spot the warning signs if a relative or friend was coming down with symptoms? If your answer is no, then I suppose you are reading the right article and should be in a better position to suspect from today onwards. 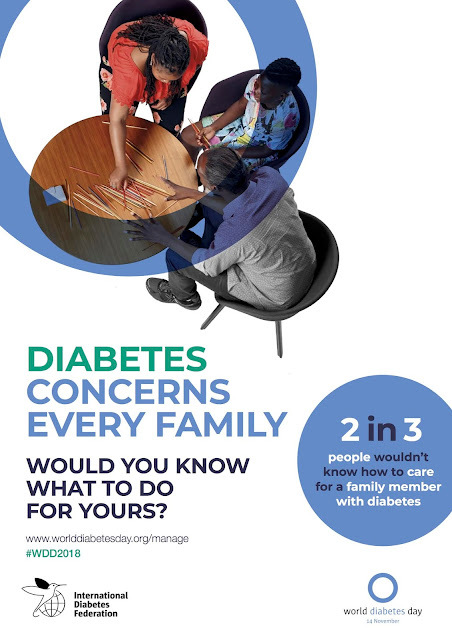 With an estimated 150 million people living with Diabetes mellitus globally, every possible help is needed, especially as management and support has to start from the family level. Daily treatment for some will involve: regular exercise and a dietician modified diet. According to the World Health Organisation, about 40% of Diabetics will however require oral tablets/medications to maintain blood sugar values within normal range and another estimated 40% will require INSULIN- the major chemical required by the body's cells to be able to absorb glucose. The condition has been noted to occur due to a total lack of this chemical (hormone) or what seems to be simple resistance to it's effects. 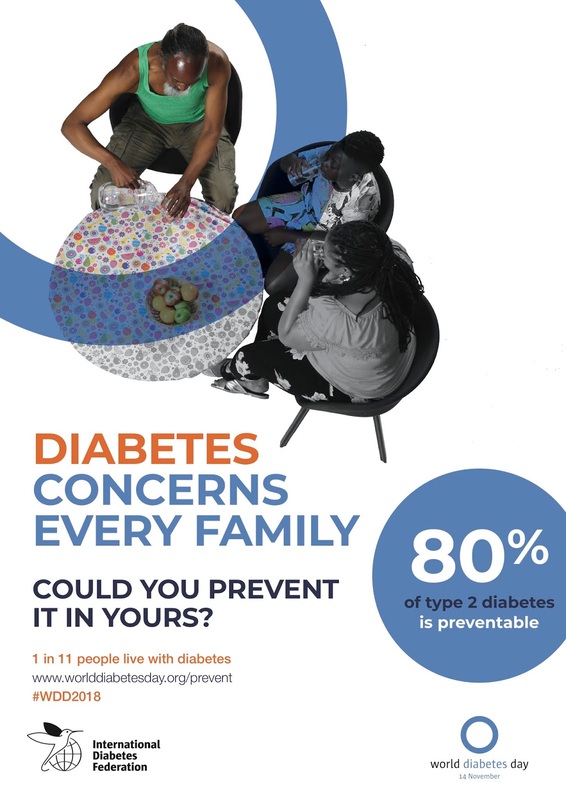 Whatever the case may be, regular visits to the hospital for routine wellness checks can make a difference and those diagnosed to be Diabetic can receive lifesaving care. It is not a death sentence but if the predicted statistics must be reversed,then charity has to begin at home. Keep a tab with "Dr. Kevwe's Blog" for a short follow up on PREVENTION. Remember, it is always better than cure. You can also visit the References below for detailed literature about Diabetes Mellitus. i was diagnosed with diabetes for 2 years ago i lived in pain with the knowledge that i wasn't going to ever be well again i contacted so many doctors and visit many hospital on this issue and wasted a large sum of money but my condition never got better i was determined to get my life back so one day i saw miss Katrina post on how Dr oriane saved her from the same infection with his herbal medicine i contacted Dr oriane on his email address droriane6@gmail.com we spoke on the issue i told him all that i went through and he told me not to worry that everything will be fine again so he prepared the medicine and send it to me through courier service and told me how to use it,after 21 days of usage I went to see the doctor for test ,then the result was negative,am the happiest person on earth now. this testimony is real.thanks to Dr oriane God bless you.